Learn more about Good Spirited: Building a Sustainable Future here. Hamilton, Bermuda, March 31, 2015 /3BL Media/ — The BOMBAY SAPPHIRE® Distillery at Laverstoke Mill not only distills gin, it also harvests energy. The facility captured the world's attention at its opening in mid-September as the number one premium gin brand unveiled how it re-captures energy with its state-of-the-art heat exchange system. The distillery is designed to operate with the greatest operational efficiencies to reduce energy use as it recycles residual heat which is a by-product from the unique "Vapour Infusion" technique used since 1836. It takes a lot of heat to make premium gin the BOMBAY SAPPHIRE® way with the historical Dakin stills. Knowing this, the Laverstoke Mill redevelopment plan offered brand owner Bacardi an opportunity to reevaluate operations and come up with new, more sustainable ideas that could carry the iconic brand through the next centuries. The Laverstoke Mill retrofit included many energy-saving additions such as the new heat exchange system, which required a considerable amount of upfront investment for the brand. The Company is proud of the pioneering heat exchange techniques that provide measurable environmental and commercial benefits to the distillery. In accordance with the Bacardi “Good Spirited” environmental sustainability initiative for responsible sourcing, packaging and operational efficiencies, across the entire Bacardi family of premium spirits brands, BOMBAY SAPPHIRE is doing its part to fulfill the Company's net-zero impact goal on the environment. This initiative requires all of the Bacardi brands to track methods such as energy expenditure and consider new ways to increase sustainability. Globally, Bacardi has reduced nonrenewable energy use by nearly 28%, supported by a nearly 28% decrease in greenhouse gas emissions from production. This is no easy feat when you reflect on the energy and water-dependent production process of the Company's portfolio of brands, including BOMBAY SAPPHIRE. 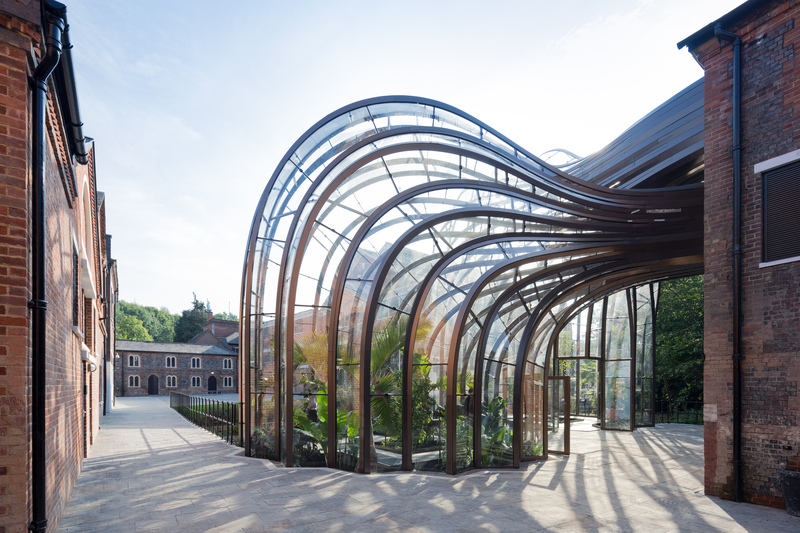 With the BOMBAY SAPPHIRE Distillery at Laverstoke Mill fully operational, the Company will surely move ever closer to its net-zero-impact goal. “At the distillery, what goes around comes around as the heat used to fire the stills is channeled back from India House, the distillation room, through a series of unobtrusive pipelines to warm the property’s buildings and the gorgeous glasshouses, which are a main focal point at the renovated distillery,” says BOMBAY SAPPHIRE Master Distiller Nik Fordham. Nothing goes to waste during the distillation process as energy reduction starts with the high-tech biomass boiler, which uses low-tech materials or any suitable organic matter such as the spent botanicals used in the gin-infusion process and wood chips to superheat water. Once heated, steam leaves the biomass boiler, travels across the 18th century courtyard to the antique stills where alcohol is boiled, turns to steam and enters the copper baskets that hold the 10 fragrant botanicals, which impart the taste that is unique to BOMBAY SAPPHIRE gin. The infused vapor is then cooled in a condenser, turning it into high-strength gin. This gin distillation process is repeated all day long, so it made sense to actively harness every ounce of energy and water possible to passively reap the energy-saving benefits. During distillation, hot water is collected in a storage tank ready to be reused, while the used gin botanicals are gathered and transported to the biomass boiler to burn them for the next distillation cycle. With this kind of circular heat recovery the distillery raises the bar among spirits companies as one of the most sustainable gin brands worldwide. The BOMBAY SAPPHIRE Distillery’s use of renewable energy produces low-carbon energy and, as a byproduct, even provides the property's hot water—noteworthy accomplishments and deemed "major environmental features," according to BREEAM, the world's foremost environmental assessment method and rating system for buildings. In fact, the organization recently dedicated its prestigious 2014 BREEAM Industrial Award to the renovated distillery — a testament to the BOMBAY SAPPHIRE commitment to producing the finest spirits with only the most sustainable practices. The project scored 100% of available credits in the Energy and Management categories and more than 90% of credits in the Water, Materials and Waste categories—high marks even for non-industrial buildings. The BOMBAY SAPPHIRE Distillery at Laverstoke Mill is a model of operational efficiency as it extracts the maximum value out of all of the energy it uses. Sustainability is a constant commitment that Bacardi promises with every bottle. BOMBAY SAPPHIRE is the fastest growing of the major premium gin brands and the world's No. 1 premium gin by value. Based on a secret 1761 recipe, BOMBAY SAPPHIRE gin is created by perfectly balancing a unique combination of 10 hand-selected exotic botanicals from around the world. The natural flavors of the botanicals are captured through a delicate distillation process called Vapour Infusion, which results in the tantalizing, smooth and complex taste that is BOMBAY SAPPHIRE. The BOMBAY SAPPHIRE® brand is part of the portfolio of Bacardi Limited, headquartered in Hamilton, Bermuda. Bacardi Limited refers to the Bacardi group of companies, including Bacardi International Limited.